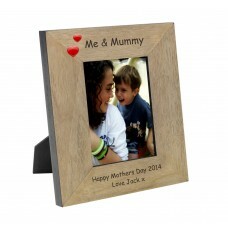 A high quality finish oak veneer wood frame. The top is engraved with Me and Mummy and two cute hearts, and the bottom of the frame is left free for your own personalised message. Available portrait or landscape.Engraving character limit120 Layout ChoicePortrait,LandscapeSend your text/texts or pictures by e-mail to order@thankumum.com. Please specify the order number.